Home > Uncategorized	> Revenge of the Electric Car, part 2 of ? Revenge of the Electric Car, part 2 of ? After the documentary there was a mini- auto show in the Marriot hotel next door. You can visit the photo album from the link at right, where there are 24 pictures from the show. Motor-powered Transportation photo album, to which I just added 24 photos of this auto show. Of course everyone wanted to Ooh and Ahh over the Tesla roadster, but the most impressive vehicles there were the high-production models. These included the Mitsubishi MiEV, the Nissan Leaf, Chevrolet Volt and the Fisker Karma. The Chevvy Volt seemed like the least audacious entry, designed to appeal to people who wouldn’t want anyone to know they were driving an electric car. But it is somewhat understandable; Chevrolet has not had good experience with innovative designs. Conventional has always been their comfort-spot. Most daring would certainly be the Nissan Leaf; the company CEO basically bet the whole corporation on it. But it’s only daring in terms of corporate survival; the Leaf is a practical-looking vehicle designed for small families. The Mitsubishi MiEV looks funny but don’t be fooled; it’s bigger on the inside. It just doesn’t waste space on a long hood and trunk. People I saw getting in and out of one seemed to do so very easily and the interior was really roomy. The only way to improve it would be to manufacture it at the Mitsubishi plant in Normal, Illinois, dammit. 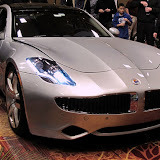 What’s a Fisker Karma, you ask? It’s a luxury electric sedan and oh baby is it sweet. That is one beautifully-finished automobile, and it seems to be designed so the owner won’t have to make excuses for its comfort or craftsmanship. If you are a one-percenter and your Bentley is starting to bore you, this is the car for you. I wish I could have nicer things to say about the Tesla Roadster. Sure, it really burns up the asphalt but the best thing that comes to mind is; “It will draw attention to electric vehicles.” The craftsmanship wasn’t all that impressive, and it was entertaining to watch people trying to climb into and out of the car. Heaven help you if you go over a bump of more than four inches. I very much enjoyed seeing the custom-made electric motorcycle that somebody made out of an old Harley, and the old 1975 Vanguard Electric car. That Vanguard is probably what people think of when they think “electric car”. I think of “spending $400 on ‘fuel’ each year instead of $1,400″. It is true that all-electric cars have limited range and take hours to charge up. But for commuters I’m not sure how much that will really matter. Some way-out stuff—don’t think I’ll be trading in my Prius just yet!! There are some things that didn’t impress me at all with the Chevy Volt. Mostly, why have the two seats in the back? A bench is much more practical. Also, there is no room at all for anyone one of average size back there without squeezing it from the front. Poor design. Might have well made it a two seater. I’m waiting to see the sedan from Tesla. Cheaper and still amazing range. Should be interesting.